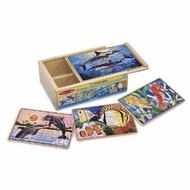 Set includes four separate wooden, 12-piece sea life jigsaw puzzles: sharks, sea horses, dolphins and tropical fish. Each is stored in a separate compartment of a sturdy wooden box. The slide-on box lid doubles as a convenient puzzle board. Each puzzle piece is shape-coded on the back for easy sorting. Great for travel! Measures 14.5" x 10.5" x 2.5".